As with all other tropical countries, Panama is an extremely interesting place both from a geographical and cultural point of view. It is a fascinating destination for those who wish to travel and you could do worse than spend a few weeks here if you embark on your tax nomad quest in Panama. And as with every place that’s a bit out of the way there are a list of do’s and don’ts which you should follow. One of the most useful things that you could do when visiting Panama is to learn a smattering of the lingo and that is Spanish. You will find English spoken in the main areas such as Panama City, Bocas del Toro and Boquete but if you are a bit adventurous and want to venture further afield is not so common. Almost all the population of Panama speaks Spanish however so you do worse than learn the language. If you’re eating out make sure to check your bill and if a service charge of around ten per cent is not included, make sure to leave a tip for about that amount. Since the dollar is the official currency in Panama, make sure you bring some cash with you to use. And this should be in denominations less than fifty as its quite difficult to get change for a fifty or a hundred dollar bill. If you intend to move around or stay on the beach in the summer, make sure you protect yourself as much as possible by using the appropriate sunscreen due to the fact that the sun is very intense and powerful and you’ll be toast in no time. Since Panama is also a tropical country, you have to bear in mind that mosquitoes are a problem so you should invest in some repellent to minimize the risk of contracting some sort of tropical disease such as Malaria or Yellow Fever. Vaccination is important when travelling to Central and South American countries so it’s also important in Panama. You should get these at least four to eight weeks before you go there. If you are visiting areas such as the autonomous territories, Darien and Colon you should take vaccination for Hepatitis A as well as typhoid. The vaccination for malaria and Yellow Fever are also a safe bet if you are venturing into some of the forested areas. Whenever you can you should make use of Panama owned business and use the services they provide. This will make you more accustomed with the people and their culture as well as make your visit easier. Try not to carry valuables around with you especially precious stones and important identification documents such as passports, or at least do not keep them visible to others. Avoid carrying equipment such as a laptop around as though Panama is considered quite safe you never know what you may find. Avoid drinking tap water and also wear jeans as much as possible since it is considered to be the uniform here in Panama – unofficial that is! One of the most important things not to do while in Panama is never to feed, bother or cause harm to Panama wildlife. The country has one of the most diverse biodiversity in the world and there are also many species which are on the danger list unfortunately. As much as possible do not go off the beaten track when you are in the forest since you might end up in harm’s way. The forest of Panama is home to an astonishing variety of snakes that almost number 130 and they are all poisonous and dangerous. When you decide to take a taxi be careful to agree on the fee before you leave since this could lead to a great hassle if the fee is suddenly pushed up or doubles! You should be careful of flaunting your wealth around – this should also be avoided as much as possible in crowded areas. Pick pockets usually roam about in the most populated centres such as Panama City so never show your smartphone or camera around too much. You could realise that you are without it before you know it. 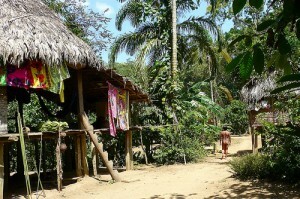 And if you are trekking in Darien Province make sure you do it with a guide especially next to the border with Colombia. Due to the denseness of the jungle there are quite a few armed mercenaries as well as drug traffickers running around so if you get lost you could be in severe danger. Always be prudent and keep to inhabited areas as much as possible.